Are you ready for Day #3? There was A LOT that went on. 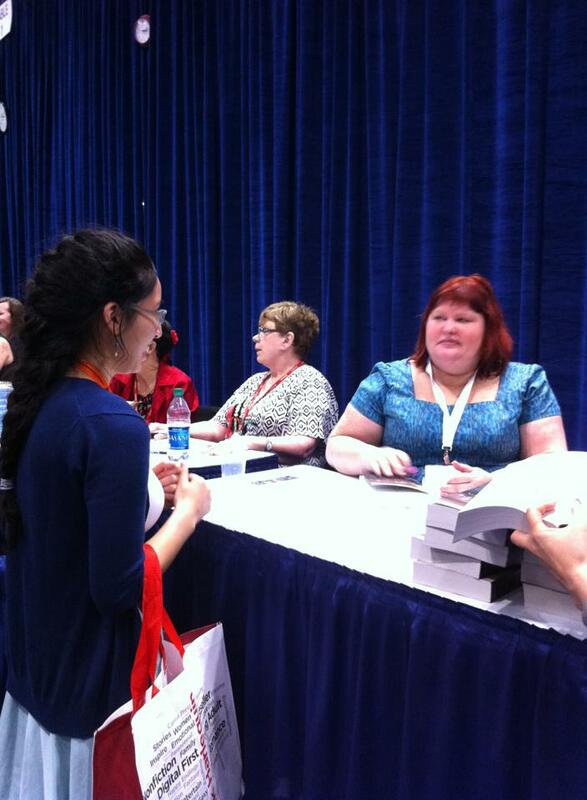 We'll start with the fact that two of the authors I really wanted to meet were ticketed: Cassandra Clare and Rick Riordan. This means you have to stand on line VERY early in the morning to get tickets. 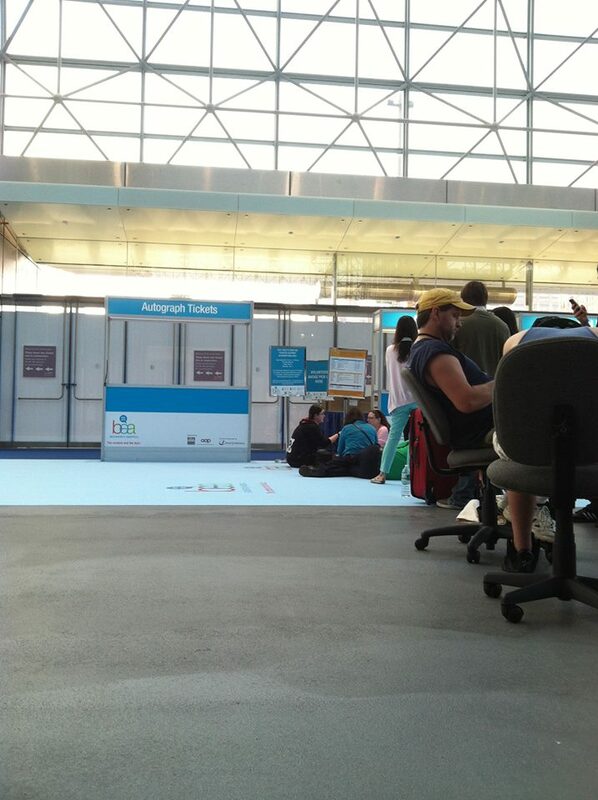 While I was really wanting to see them, I didn't want to get up and go over to Jacob Javits at 5:45am. So I decided not to do it. 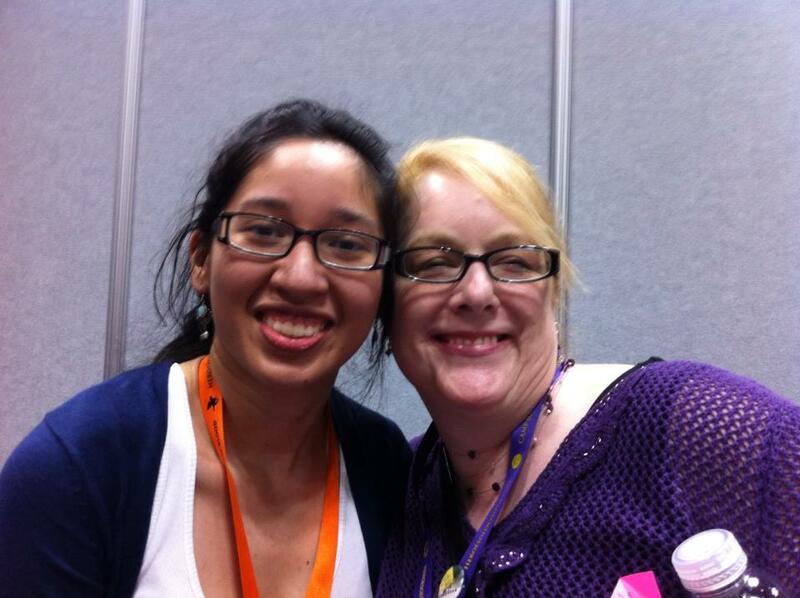 But D'vora was determined to meet Cassie. 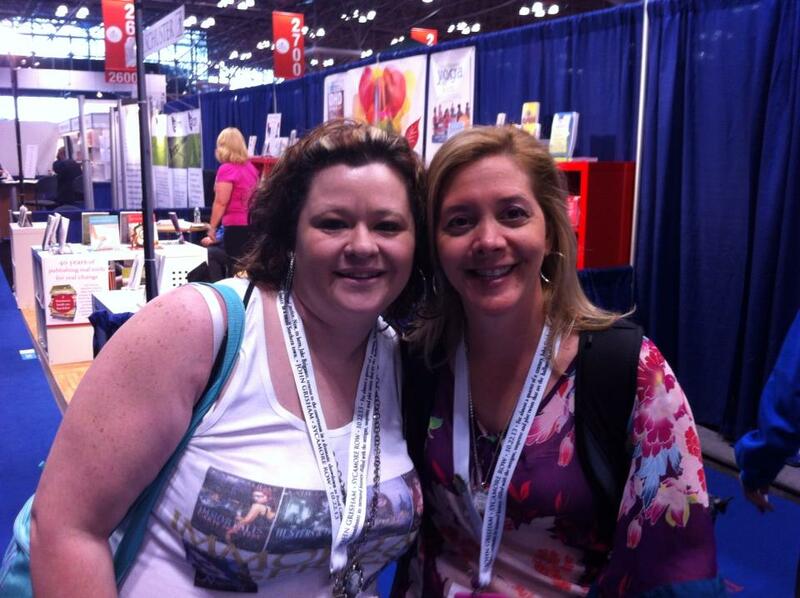 So she and the most awesome Sherry Ficklin (author of Extracted) pulled themselves out of bed to stand in line! 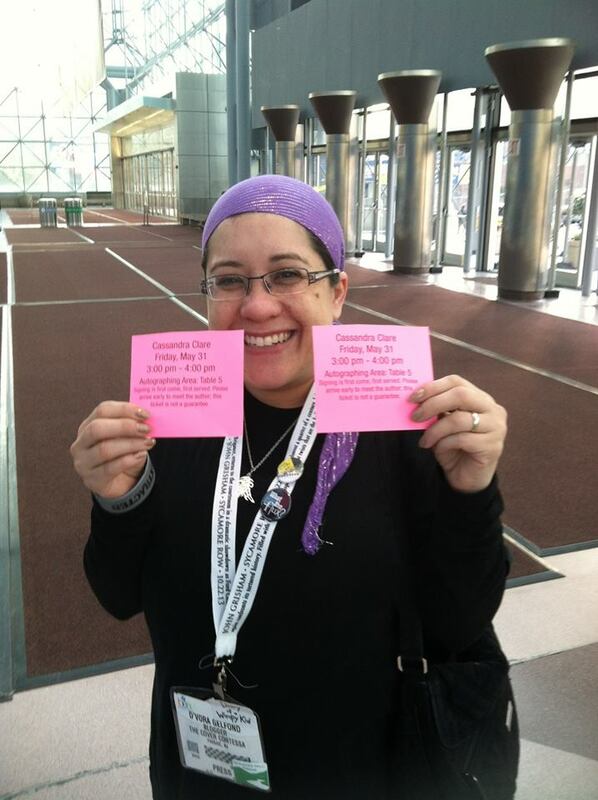 See how D'vora is holding TWO tickets to Cassie??? 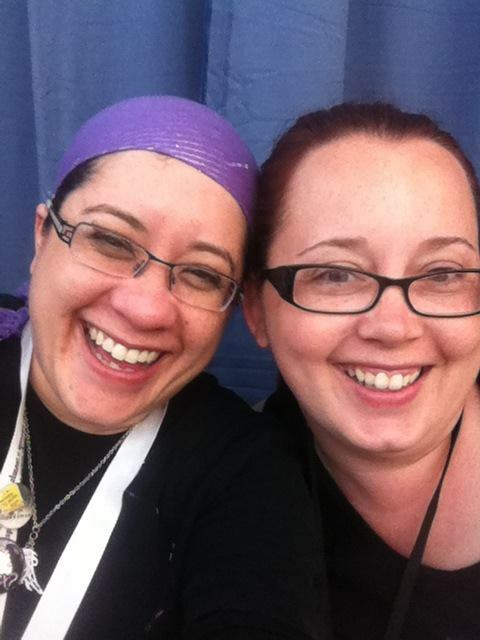 Yup, she is most awesome (and that is why she is my bestie) and showed up back at our room with one ticket to Cassie and Rick for each of us! I guess the powers that be changed their minds about people only being able to get one! YAY! Once we got over the initial jumping and screaming in our room, we got dressed and ready to head out to JJ for another day of snarffing and author lollygagging! 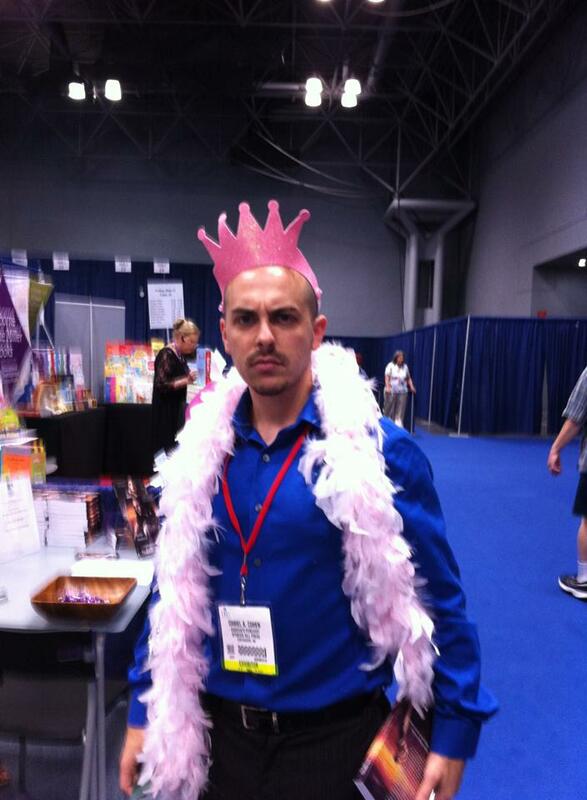 We had to get in line early for Riordan's signing and I snapped this picture while I was standing there. I know the author and the book, but for the life of me can't remember the name! If anyone knows, please comment! 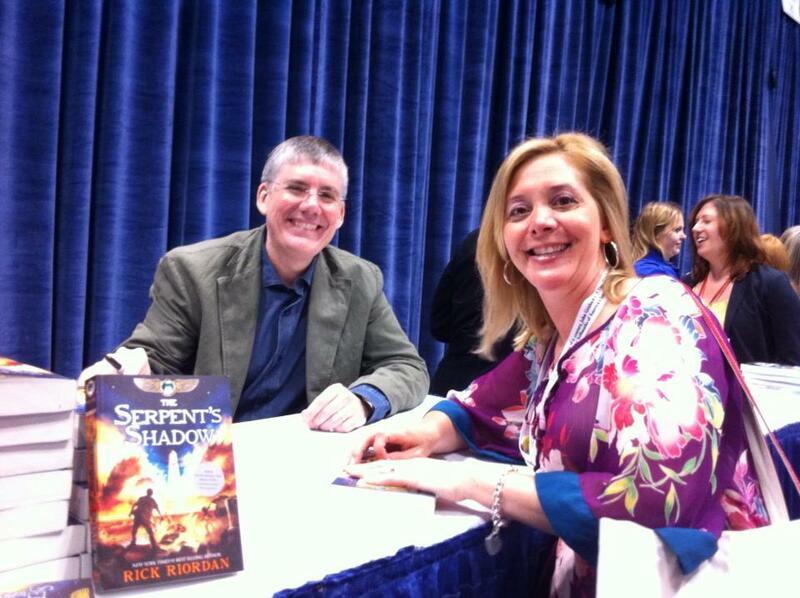 Then we got to meet Riordan, author of the Percy Jackson and Kane Chronicles series, and snap some shots with him after he signed paperbacks of The Serpent's Shadow (Kane Chronicles, #3) for our kids! 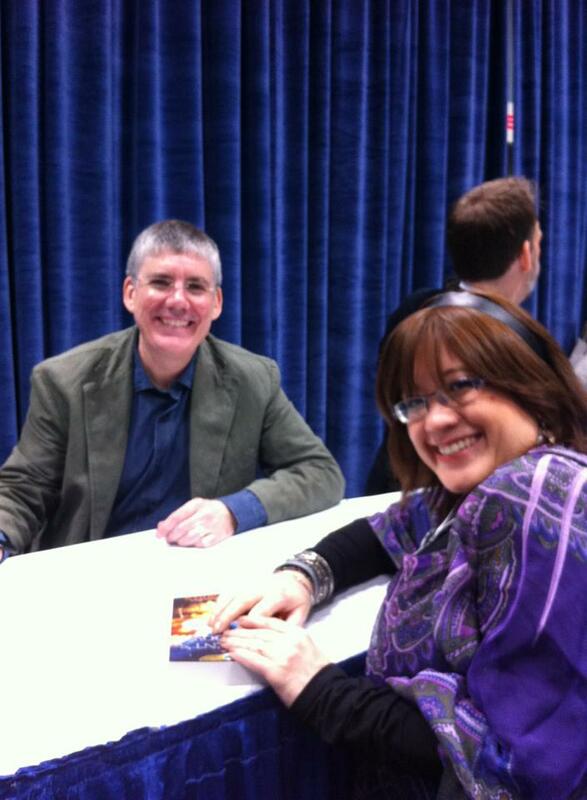 Even more exciting was that right next to Riordan was Jeff Hirsch author of The Eleventh Plague, Magisterium, and his newest book due out in the fall of 2013 Darkest Path (which you can see we got copies of)! 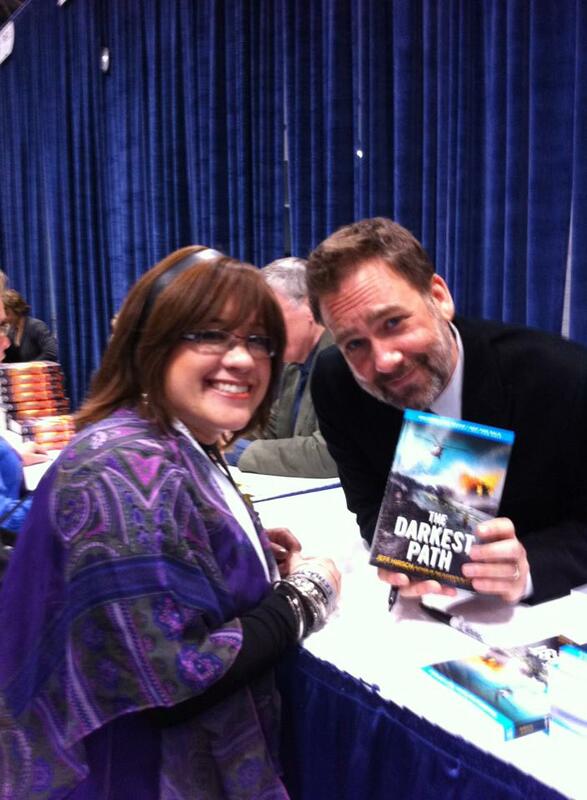 I had the pleasure of meeting Jeff last year at YA Fest 2012 in Easton, PA. And he will also be featured as one of the authors during June's male author month here on The Cover Contessa and over at Never Too Old for Y.A. Books! 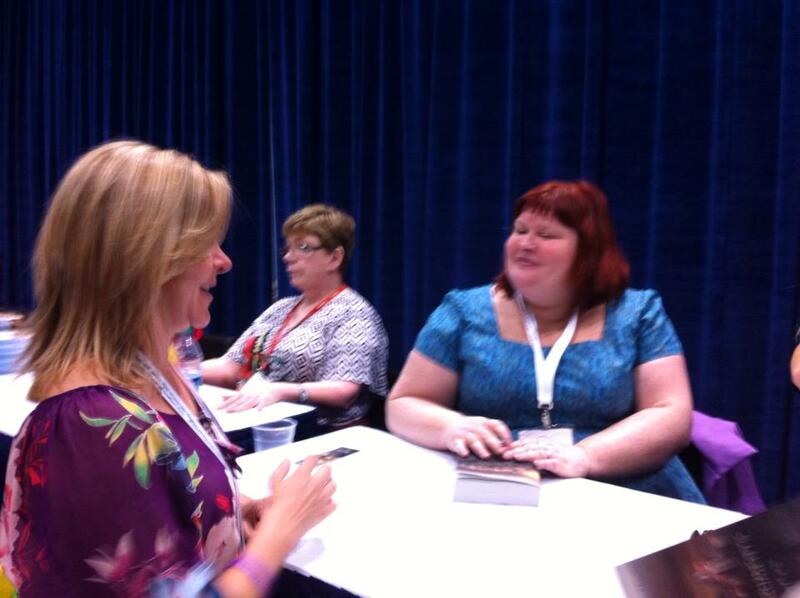 On our way out of the autographing area to snarf more books, we noticed that Sylvia Day's line was NON-EXISTANT! 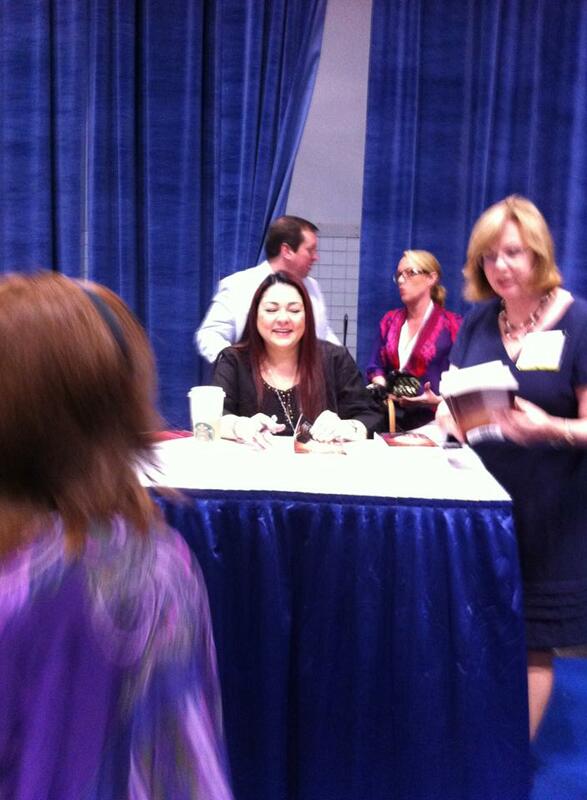 So of course we stopped by to grab a signed copy of her book, Reflected in You (Crossfire, #2) and snap some photos! 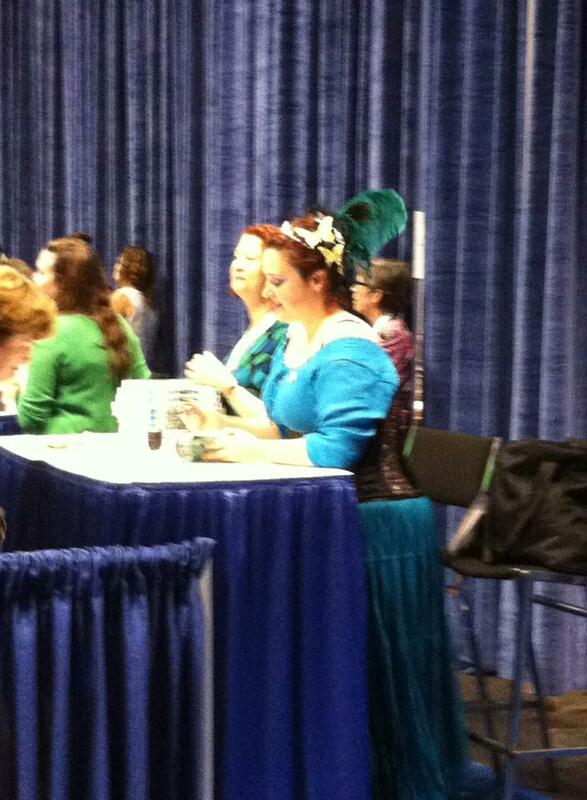 She was so sweet and told us to come around the table so we could be next to her! 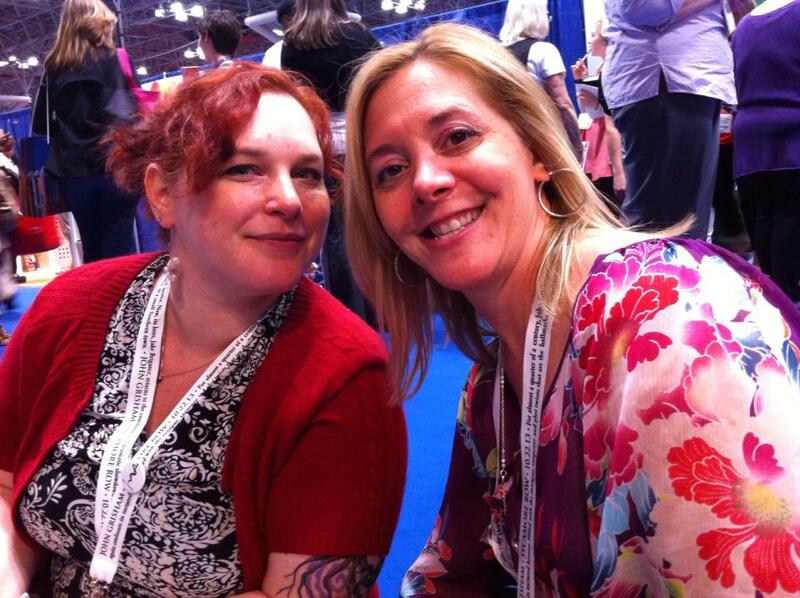 Once our fangirling was over, we ran around snarffing lots and lots of books. 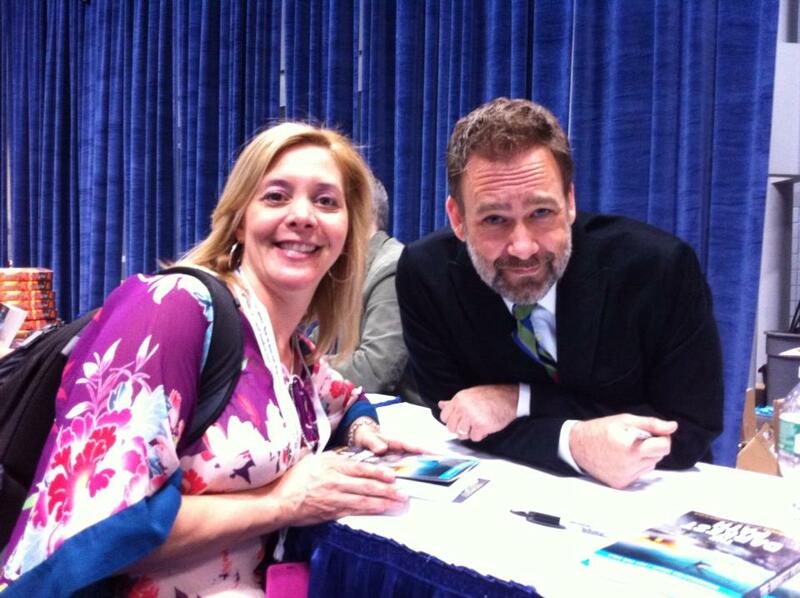 D'vora got on line to wait for Julie Kagawa (yes, meeting her the day before was not enough, she needed more) and I ran around getting a few signature of my own! Joelle Charbonneau Author of The Testing (The Testing #1) and the soon to be released Independent Study (The Testing #2) (of which I snarffed a few extra copies for giveaways, so kep an eye out!). 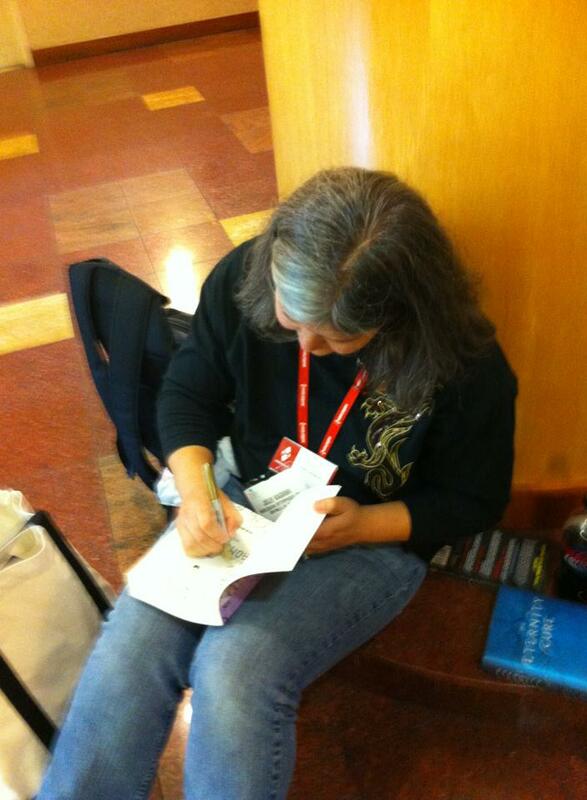 Richelle Meade signing a copy of Gameboard of the Gods (Age of X, #1) for me. This was a surprise, actually. I was wandering around and saw a short line. I peaked and saw it was her and luckily waited only 3 minutes! I have friends who waited for more than an hour! Ok, so I didn't get to actually meet Giada De Laurentiis, but I did get to snap a photo of her! 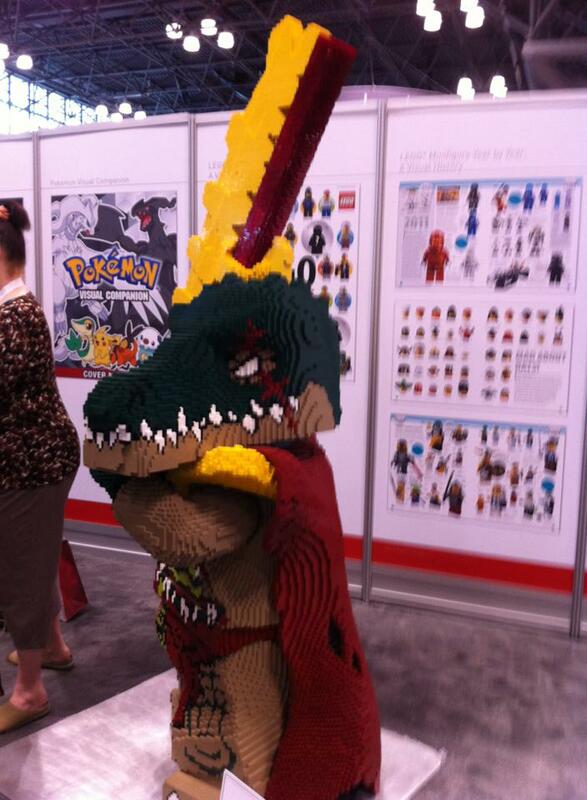 And I got a picture of this cool Lego Dragon along the way! 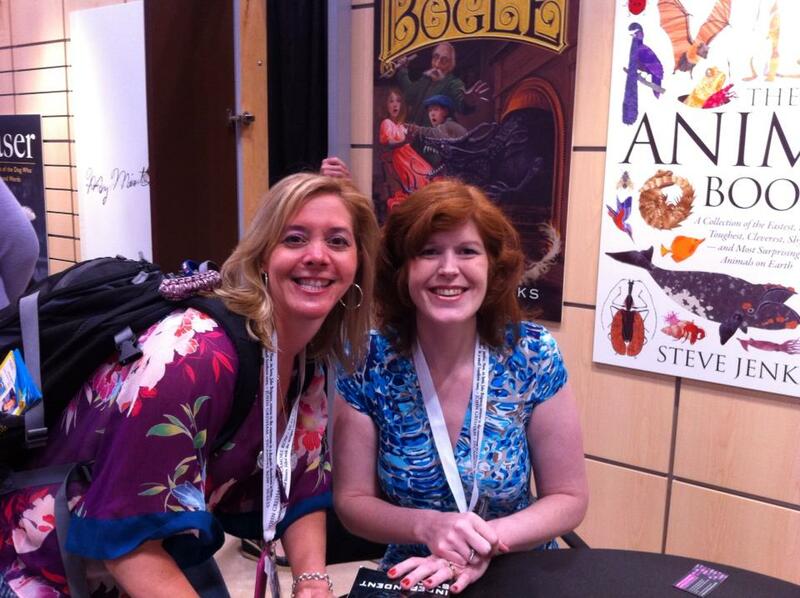 I finally made my way back to D'vora, who was just finishing up getting Julie to sign a bunch of her books. 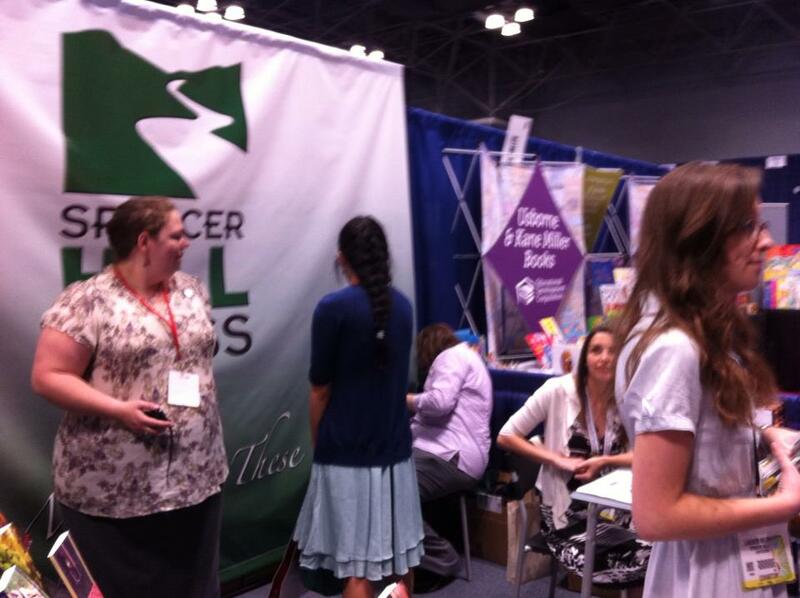 We took off again, insanely trying to grab what we could before we had to be back at Spencer Hill Press for JK Rock's signing of their novella Camp Kiss! 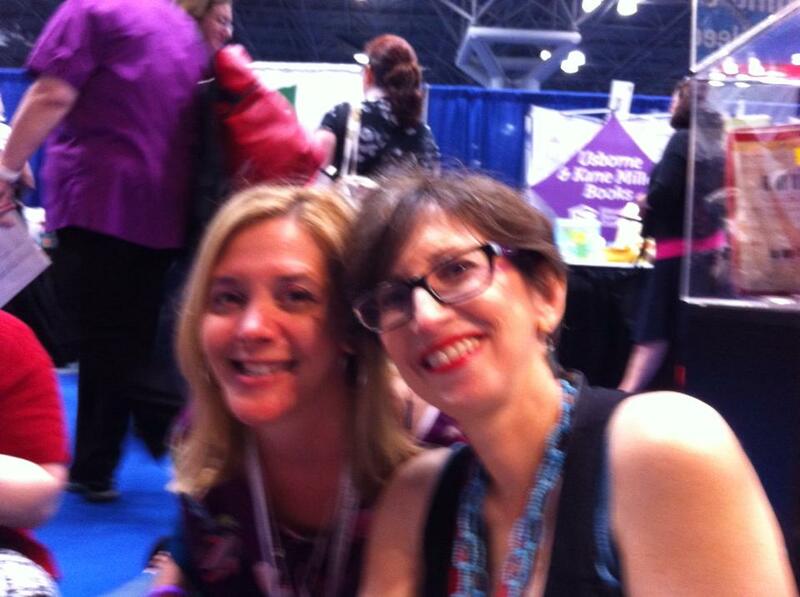 While we waited for the signing to start, I snapped a few photos with some of Spencer Hill Press's leading lady authors, Jennifer Allis Provost on the left and Lisa Amowitz on the right, and even got a great one of the most awesome SHP swag fairy, also known as author Dan Cohen! 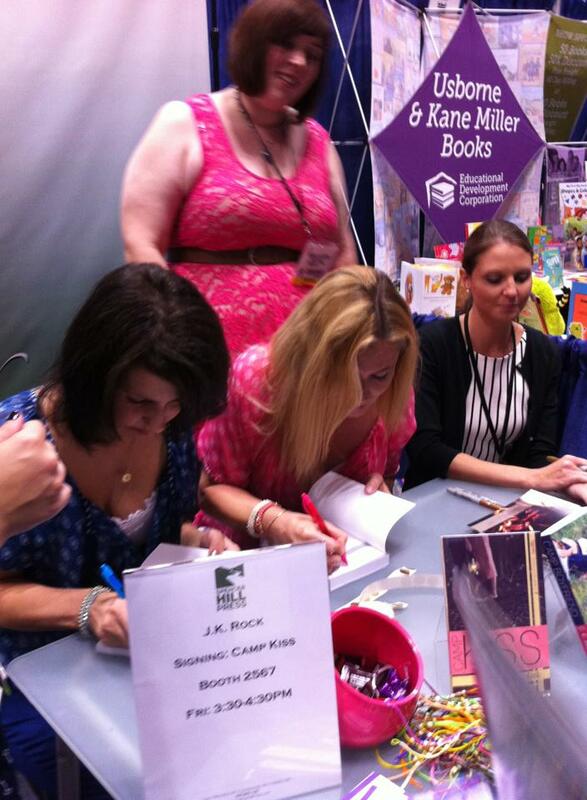 JK Rock signing their novella Camp Kiss! 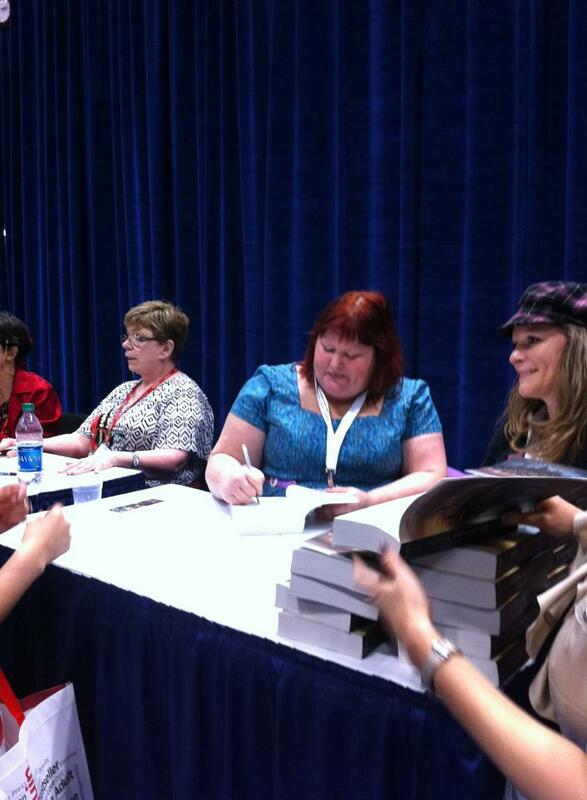 Then it was time to go stand on line for the wonderful Cassandra Clare! 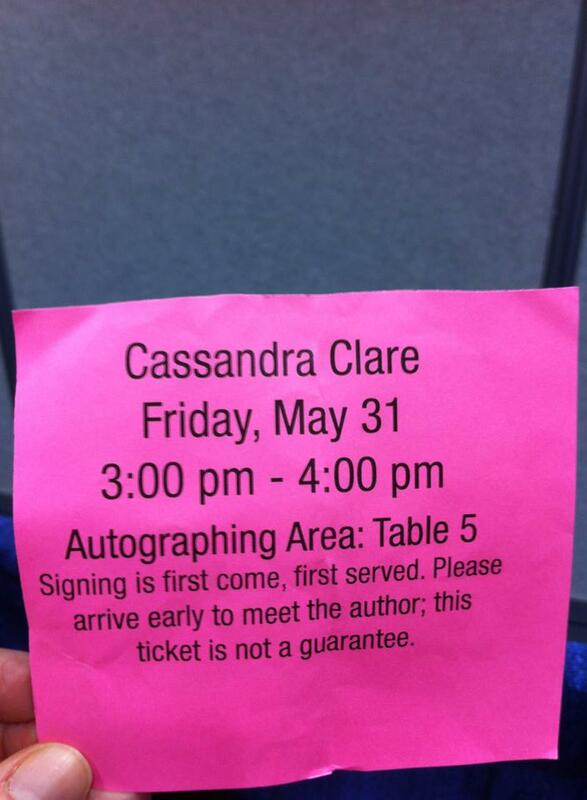 We had to be in line 45 minutes early to ensure we would get to see her and hopefully get one of the very special movie copies of City of Bones (The Mortal Instruments, #1)! Here we are waiting in line! 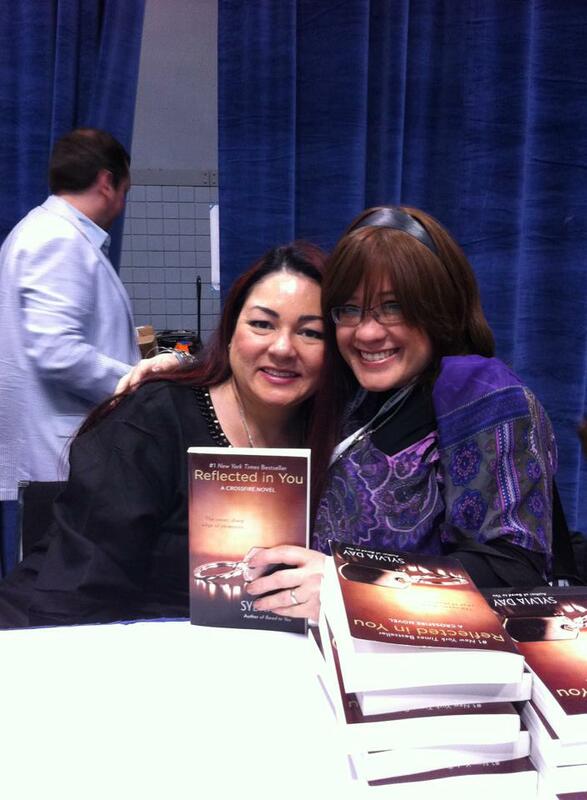 We got to hang with the most awesome Sherry Ficklin, Michelle Pickett (author of PODs) and SHP editor Marie Romero! And then it was time!!!! That's Katie from Mundie Moms sitting to Cassie's left! Finally, we made our way back to SHP for our final singing of the day before we had to leave to go back to NJ, Kelly Hashway author of Touch of Death (Touch of Death, #1) and the soon to be released Stalked by Death (Touch of Death, #2). 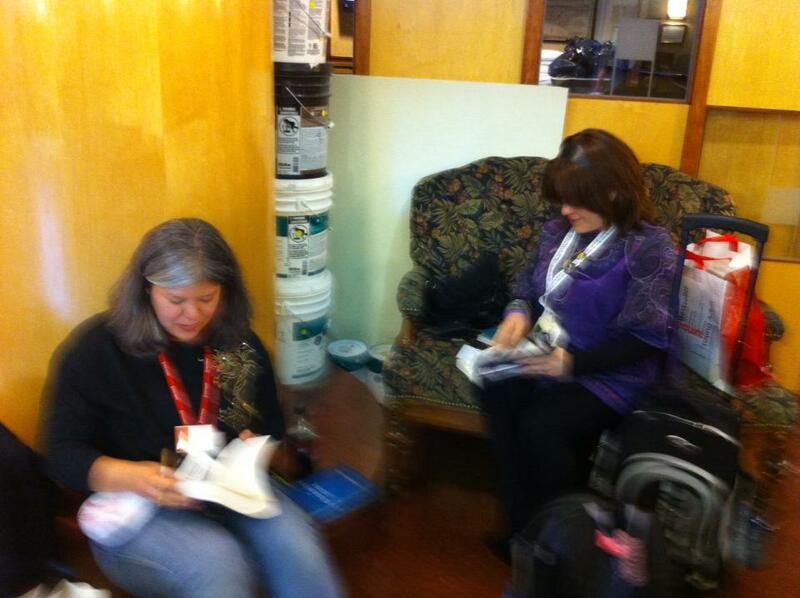 See author Kelly Hashway sitting at the table getting ready??? 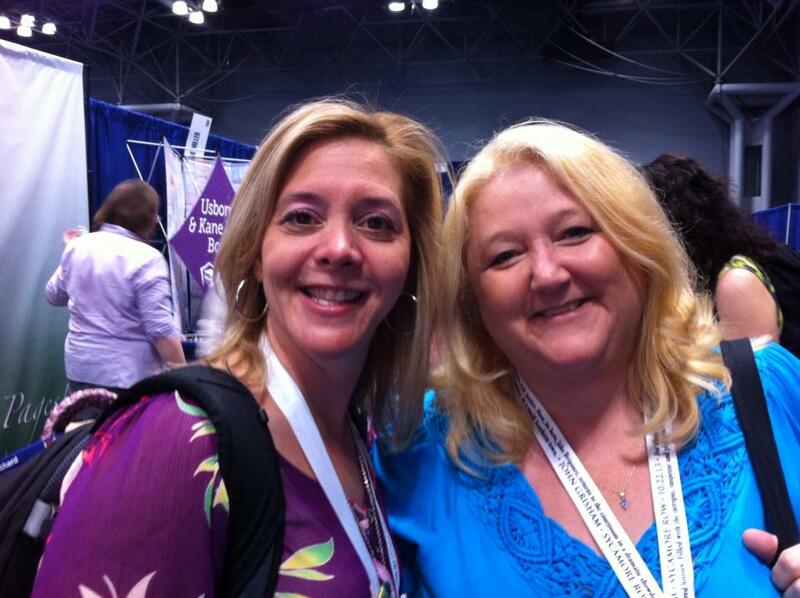 While waiting in line for Kelly's book, I met up with fellow blogger and tour organizer Anna Dase on the right of Read Between the Lines and author Mary Lynn Bast on the left (who gave me signed copies of all her books!). When we went back to the hotel to grab our bags, who walks into our hotel lobby??? 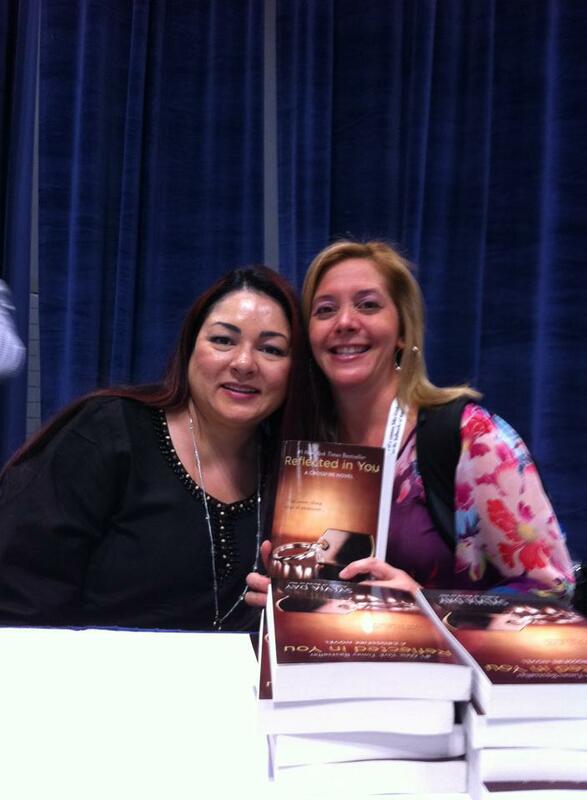 The one and only Julie Kagawa (who publishes under Harlequin Teen). D'vora was so excited. 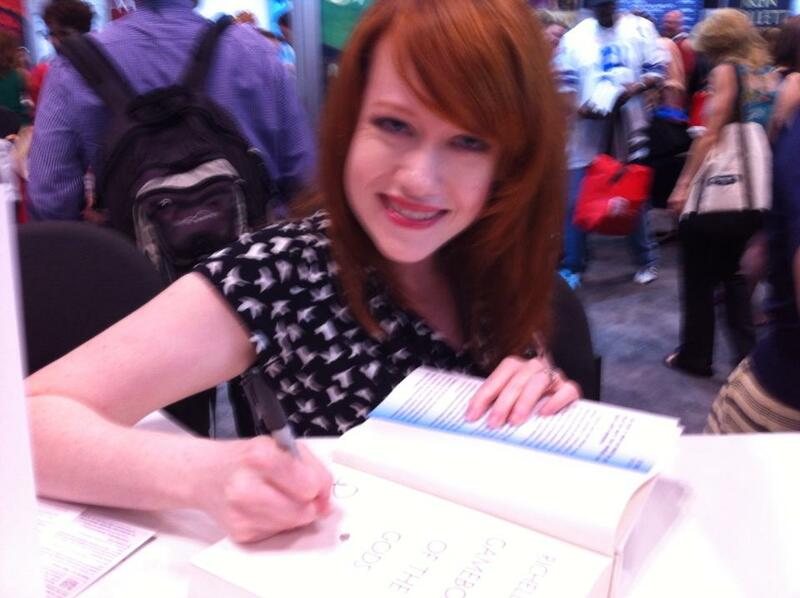 She asked Julie to sign the rest of her books (since she couldn't get them done at the convention center) and Julie AGREED! She is most awesome! As you can imagine, this totally and completely made D'vora's day since she a HUGE Kagawa fan! And that was the end of our day. We jumped in the car, I returned D'vora to her family and then made my way home to mine to try and get some rest before the final day of BEA. Stay tuned for the wrap up tomorrow! 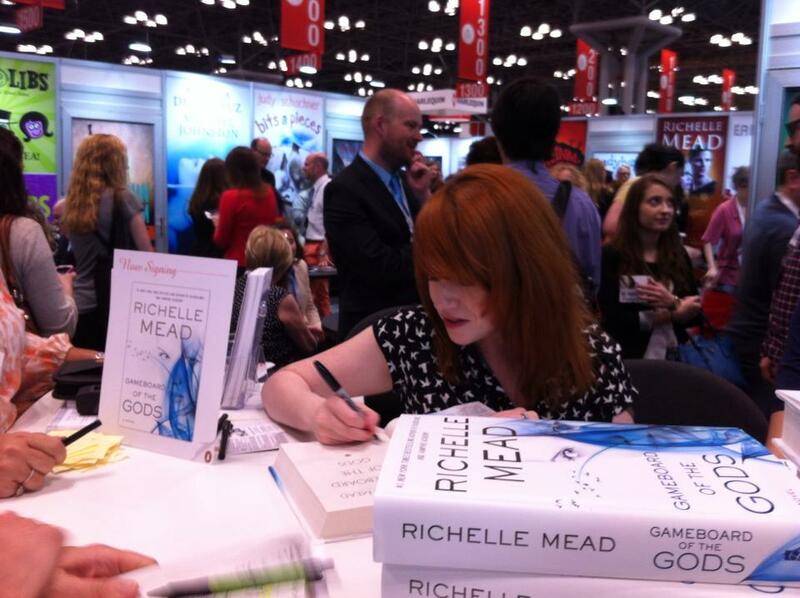 I was surprised how short the Richelle Mead line was too, I thought I'd have to wait the better part of an hour for her. It must have been longer at first b/c I have a friend who waited an hour or so before it started. But I must have hit the tail end of it because there were maybe 6 people in front of me when I got on line. I'm super excited to have a copy of it! Wow. Sounds chaotically awesome. Off to check out the other posts (been seeing them in my email, but no time to read yet--sorry). It was truly chaotic, but in a good I got a rush kind of way! Wow lucky that you only had to wait a few minutes for Gameboard of the Gods! I stopped by that line to check it out. I was late so I was hoping it would have died down.. but NOPE! The line was huge so I bailed. I'm not even sure what time I got there. 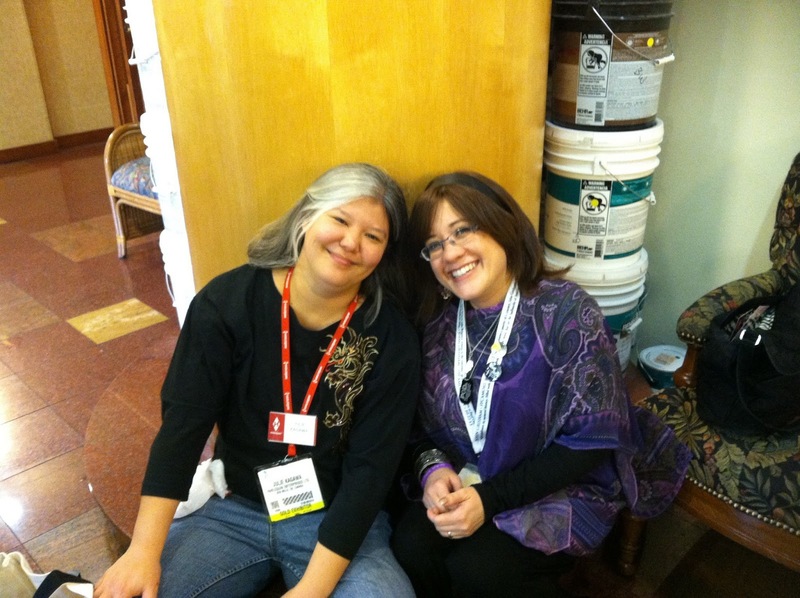 My friends were on the Harlequin line, so I was just wandering around looking for stuff. 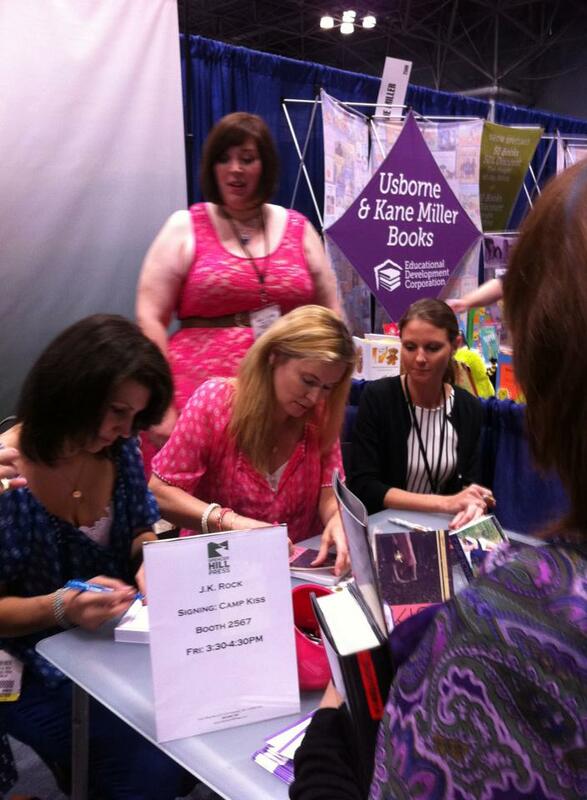 I just happened upon it, I didn't even know she was signing! I was pretty happy with the short line! I think we may have added the term Arc snarfing to the vernacular, Brooke! But no one does it quite as well as you and Dvora! Thanks for the awesome shout out to me, Jenn AP (also known in some circles as Lasagne). my Man Dan and the rest of the awesomes at SHP. I wish we could save the fun we all had in some kind of time capsule. YES!!! new vernacular a la Lisa and Brooke *snarf snarf*! 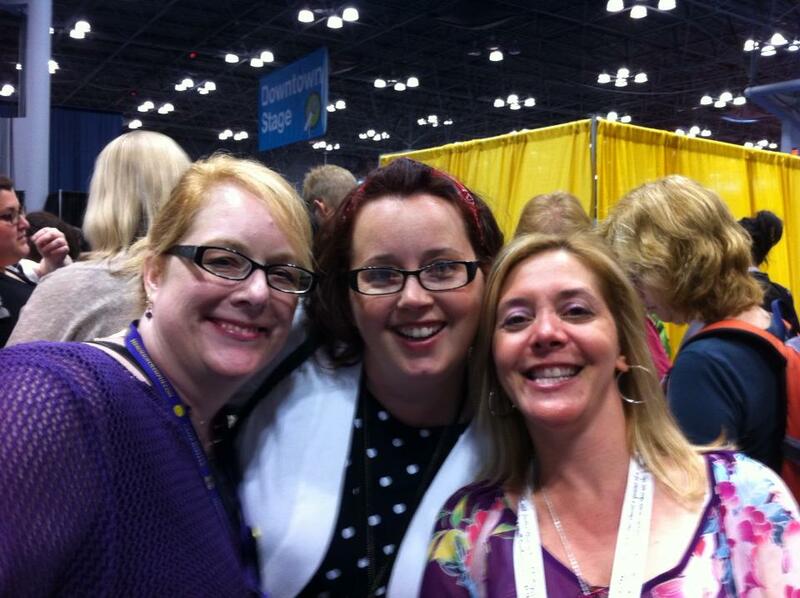 Miss you Jersey girls so much!! Why can't Texas and NJ be closer to each other?? Seriously! Who planned these United States!